SEOUL, July 26 (Yonhap) — A visiting U.S. official met Thursday with a group of South Korean businesspeople hoping to resume inter-Korean economic projects. 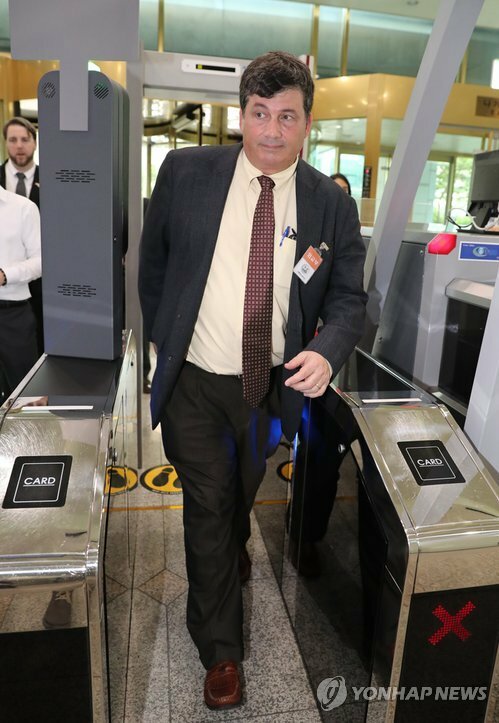 Mark Lambert, the State Department’s Korea desk director and acting deputy assistant secretary, had a round-table meeting with about a dozen South Koreans who used to do businesses in North Korea — either at the joint industrial complex in Kaesong or at Mount Kumgang for a cross-border tourist program. It took place at the U.S. Embassy in Seoul for about an hour, according to participants. One of them said the official expressed a negative view about the resumption of inter-Korean economic projects before progress on denuclearization. Lambert was quoted as saying that the U.S. is ready to support cross-border exchanges in case Pyongyang demonstrates its will for denuclearization. Earlier in the day, he had consultations with South Korean foreign ministry officials including Kim Tae-jin, head of the North American affair bureau, and Jeong Yeon-doo, director general for the North Korean nuclear issue. The ministry labeled it as part of routine “strategic” consultations between the two sides on North Korea. His two-day trip is “part of strategic communication that has been made between South Korea and the United States on various levels for complete denuclearization and the establishment of permanent peace on the Korean Peninsula,” the ministry’s spokesman Noh Kyu-duk said at a press briefing. The allies had in-depth discussions on ways to achieve “substantive progress” in the efforts through the implementation of the inter-Korean Panmunjom Declaration and North Korea-U.S. summit talks, Noh added.